This contribution introduces a class of Galois field used to achieve fast finite field arithmetic which we call an Optimal Extension Field (OEF). 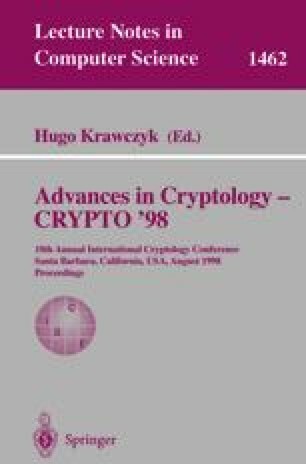 This approach is well suited for implementation of public-key cryptosystems based on elliptic and hyperelliptic curves. Whereas previous reported optimizations focus on finite fields of the form GF(p) and GF(2 m ), an OEF is the class of fields GF(p m ), for p a prime of special form and m a positive integer. Modern RISC workstation processors are optimized to perform integer arithmetic on integers of size up to the word size of the processor. Our construction employs well-known techniques for fast finite field arithmetic which fully exploit the fast integer arithmetic found on these processors. In this paper, we describe our methods to perform the arithmetic in an OEF and the methods to construct OEFs. We provide a list of OEFs tailored for processors with 8, 16, 32, and 64 bit word sizes. We report on our application of this approach to construction of elliptic curve cryptosystems and demonstrate a substantial performance improvement over all previous reported software implementations of Galois field arithmetic for elliptic curves.